And on top of that you can get these things while the supplies last…! 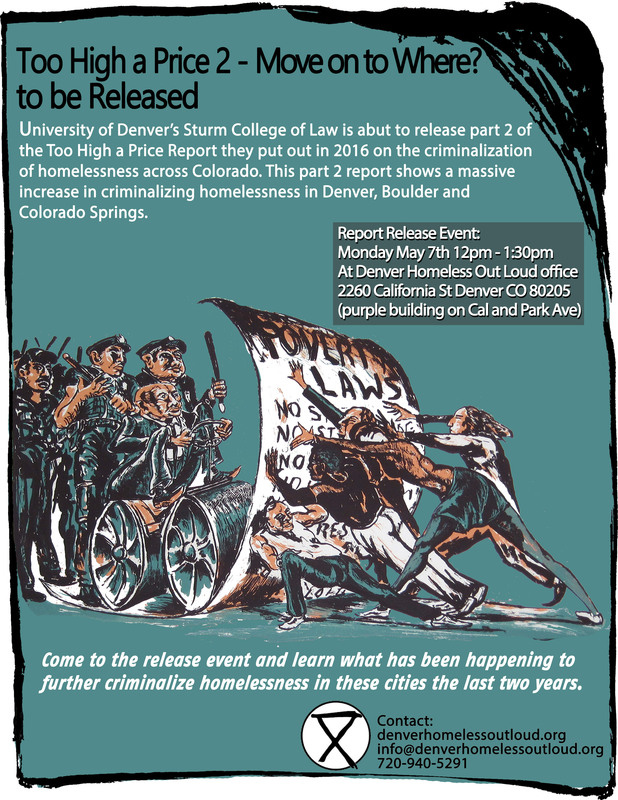 The University of Denver Sturm College of Law’s Homeless Advocacy Policy Project (HAPP) has published new research on how Colorado policymakers continue to criminalize homelessness in a new report titled Too High a Price 2: Move On to Where? In 2016, the University of Denver Sturm College of Law published the groundbreaking report Too High A Price: What Criminalizing Homelessness Costs Colorado. Too High a Price 2 continues the work of that report, and provides a comprehensive look at how municipal ordinances across Colorado disproportionately affect the homeless population in Colorado Springs, Denver and Boulder. In the process of examining Colorado’s ever-increasing criminalization of homelessness, Denver Law students found that law enforcement frequently issues “move-on” orders in an effort to remove visible signs of poverty from its city streets. At first glance, these move-on orders may seem like a viable alternative to outright criminalization. However, with the extreme decline in affordable housing and the lack of emergency shelter space to accommodate Colorado’s growing homeless population, these move-on orders leave homeless people with nowhere to go. The Denver Law student authors of Too High A Price 2 will present the report’s methodology and conclusions and answer questions at a press event on Monday, May 7, from noon-1:30 p.m. at 2260 California St., Denver, CO 80205. The overall number of anti-homelessness ordinances has increased. Between Denver, Colorado Springs and Boulder, there are at least 37 ordinances that criminalize behaviors associated with people experiencing homelessness. Since Too High a Price was first released, Colorado Springs has added one new anti-homeless ordinance and Denver Law students found four additional ordinances in Denver. Colorado Springs and Boulder have increased the number of citations issued under camping bans. In 2017, Boulder issued 376 citations under its camping ban ordinance. Of those 376 citations, an incredible 81.9% were issued to homeless individuals. Additionally, Colorado Springs increased its enforcement of its two camping bans by a staggering 545% over the span of three years. Denver’s use of move-on orders has skyrocketed at an alarming rate. In 2016 alone, Denver law enforcement made contact with over 5,000 people in move-on encounters. Denver police increased its contact with homeless individuals through the use of street checks by 475% in the span of three years. HAPP also worked in partnership with local community organizations, Denver Homeless Out Loud and Boulder Rights Watch, in authoring this report. The University of Denver: Founded in 1864, the University of Denver is committed to engaging with students in advancing scholarly inquiry, cultivating critical and creative thought, and generating knowledge. The University strives to educate the 21st-century citizens and leaders needed in its organizations and communities. For additional information, visit the University’s newsroom or follow the University on Facebook and Twitter.